When I read “outdoor” walls I immediately thought of this cliff wall that I saw in Skagway Alaska. When visiting new places I enjoy walking through the alley ways and seeing what the typical tourist does not see. Indoor wall, decorated with signs. If you are interested in viewing how others interpreted Cee’s challenge….visit her page. This entry was posted in Challenge, Uncategorized and tagged alley, B&W photography, Brick Street Cafe, Cee's Black & White Photo Challenge, Okemah Oklahoma, Skagway Alaska, Walls on January 26, 2018 by treerabold. Day 2 of the 5 Day Black & White challenge. The rules of this challenge are simple. I will post 5 photos in 5 days and I will invite a different person to join the challenge each day. I am excited to invite Aletta from Now at Home. I really like the joy in her photography. The brightness of her subjects always catches my eye. I hope you all will go to her page and look through her posts. 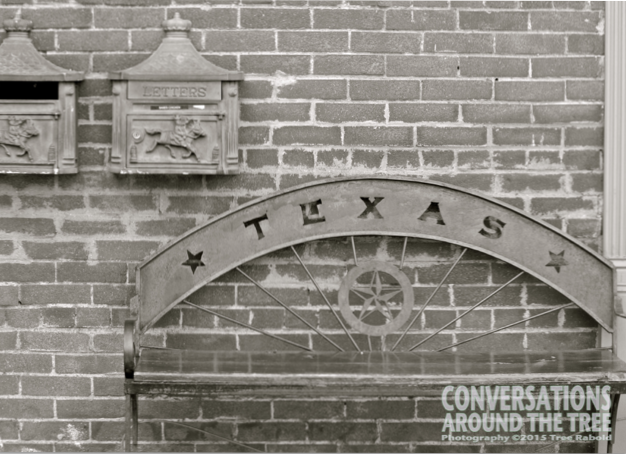 I noticed this bench outside a local restaurant in an area known as Old Town. I like the aged look of the bench and mailboxes and viewing them as black and white seems to give them even more of an antique (ish) look. This entry was posted in Uncategorized and tagged B&W challenge, B&W photography, Texas on February 21, 2015 by treerabold.